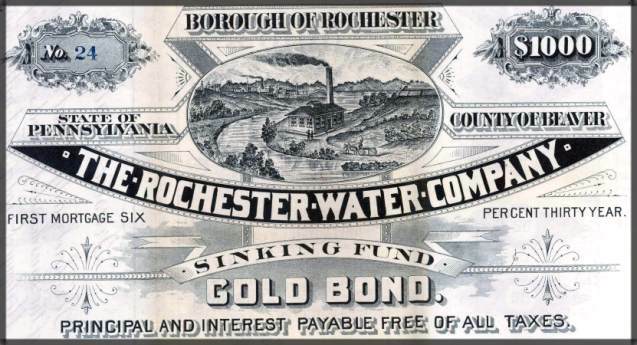 Beautifully engraved certificate from the Rochester Water Company issued in 1888. 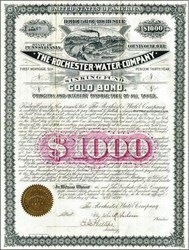 This historic document has an ornate border around it with a vignette of an early treatment plant. This item is hand signed by the company’s president ( John Y. Buchanan ) and secretary ( E. Phillips ) and is over 115 years old. There are over 60 unused coupons attached to this bond that are not shown in the scan. The bond has been folded and is in excellent condition. The scan makes it appear like it is stained at the folds, but there are no stains. History of Beaver County Beaver County was created in 1800 from parts of Allegheny and Washington Counties. The new county was divided into six townships. Hanover Township represented the Washington County contribution. North Beaver Township coincided with the First District of Donation Lands. The other four townships were divided by natural boundaries the Beaver and Ohio Rivers and Raccoon Creek. DEVELOPMENT Beaver County was created March 12, 1800. It was bounded on the north by Mercer County, on the east by Butler County, on the southeast by Allegheny County, on the south by Washington County, and on the west by the states of Ohio and, then, Virginia. Its area was 646 square miles. On March 20, 1849, a section of Beaver County was used to help form Lawrence County, now it northern boundary. West Virginia became a state by a division of the State of Virginia, and its "Panhandle" partly bounds Beaver County on the west. The county has as area of 441 square miles, including approximately eight square miles covered by water. The surface varies from 656 to 1,383 feet above sea level, the height of "Big Knob" in New Sewickley Township. The Ohio River, which is formed at Pittsburgh by the confluence of the Allegheny and Monongahela Rivers, traverses the county. The Beaver River flows into it from the north. Both rivers have been vital assets to the development of the county. The only comprehensive and definitive history of the county was written by the Rev. Joseph H. Bausman upon the occasion of Beaver County's Centennial Celebration in 1900. His historical document reveals that the name "Beaver" was given to the county from the stream and town of that name which were within its limits at the time of its formation. The name of the stream was a translation into English of the Indian word for "beaver". Previous to the layout of the town of Beaver, the point was called "McIntosh" from the fort which had been built there under the direction of General McIntosh in 1778, during the Revolutionary War. It was formerly a large Indian settlement and French trading post. The Indian tribes, the Delawares, the Shawnees, and the Ohio River Iroquois, who inhabited the territory, became the allies of the British during the Revolutionary period. At the close of the war an era of development began. INDUSTRY Beaver County, located northwest of Pittsburgh along the western border of the state, has been an integral part of the Pittsburgh metropolitan area for several decades. Its strategic location along the Ohio River provided the initial impetus for the development of the county. The topography, best described as rolling and hilly, crossed over with many streams and valleys, has been a prime determinant in affecting developmental patterns. Much of the initial development, both industrial and residential, occurred in the river valley communities. Because of its natural resources and accessibility to markets with transportation by rail and water routes, Beaver County became one of the major industrial counties of Pennsylvania. It was an important part of the Greater Pittsburgh industrial complex, widely known as the "iron and steel center of the world". Primary metal had always been the mainstay of manufacturing in Beaver County, but industry in general displayed some diversity. In 1967, 246 firms listed in the Industrial Directory manufactured glass, tile, brick, ceramics, electric products, roofing, lumber, chemicals, electrical machinery, and consumers' goods of various kinds. More than 80% of the county's residents worked in Beaver County until 1980. The decline of the national steel industry had drastic effects upon the county, reducing the labor force from nearly 100,000 in the mid 1970's to slightly over 62,400 in 1987. An increasing number of residents have been leaving the county in search of employment. Small diversified industries and services are now becoming an important part of the economy. The site of the first commercially operated atomic power plant was in Shippingport, located along the Ohio River. The plant, now shut down, is being dismantled. In close proximity to this site are the Beaver Valley nuclear and coal fired power stations, which provide electric power for commercial, residential, and industrial uses in southwestern Pennsylvania and parts of Ohio. POPULATION Beaver County, mainly an industrial and urban community, had a population of approximately 204,000 in 1980. It has no central city; the population is clustered in several centers throughout the county. The county is comprised of fifty-four municipalities. One of these is the second ward of Ellwood City, which otherwise is part of Lawrence County. The Borough of Beaver serves as the county seat. MUNICIPALITIES Beaver County's municipalities include thirty boroughs, five first class townships, seventeen second class townships, and two third class cities. All these municipalities have elected governing bodies, elected tax collectors and auditors, police departments, fire departments (most of which are volunteer), appointed solicitors, and appointed managers or secretaries. Cities and boroughs are governed by elected mayors and councils of varying sizes. In the cities, the mayor has the same vote as each of the four council members. In the boroughs the mayor does not have a vote on council but controls the police department. Each first class township is governed by a commission of five elected members serving staggered four-year terms. Second class townships are governed by three elected supervisors serving staggered six-year terms. Some townships employ a manager; others have secretaries who run the offices. TRANSPORTATION Beaver County is traversed by many major highways. The Pennsylvania Turnpike (-76) is the primary highway for through east-west traffic. The Beaver Valley Expressway (S.R. 60) provides quick and easy access to the Pittsburgh International Airport and the City of Pittsburgh, along with access to New Castle and points north. Other roadways allow for access to major highways and the interstate system. Railroads traversing the county, Conrail, and the Pittsburgh and Lake Erie Railroad, and the Chessie System (Chesapeake and Ohio), provide freight service only. Conway Yards is an extensively automated rail yard and was at one time the largest and busiest in the world. The proximity of the county to the Pittsburgh International Airport provides commercial passenger and air freight services to the county's residents and business firms. The Beaver County Airport is a general aviation airport used primarily by private and corporate planes. Bus transportation within the county and to Pittsburgh is provided by the Beaver County Transit Authority, which also offers demand and response bus transportation to all citizens. The Port Authority of Allegheny County services parts of Beaver County. The actual document looks much nicer than the scan indicates.